Mews homes date back to the 18th and 19th century and were originally intended to stable horses, with accommodation above for servants. Today, mews houses are regarded as exclusive, chic and are amongst the most sought after homes in the market place. 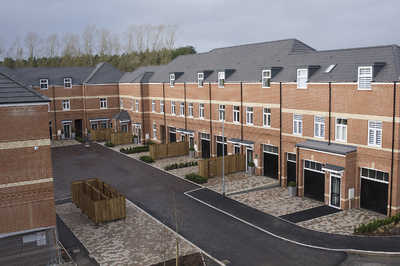 Capturing the popularity of these homes, Bellway has created Stannington Mews in Northumberland. The development offers a beautiful rural setting surrounded by stunning countryside and features a collection of 1 and 2 bed apartments and 2 and 3 bedroom terraces. For larger families there is also a choice of three storey 3 bedroom homes. Prices start from £120,995. Bellway’s Sales Director Designate, Jill Robinson, said: “Stannington Mews references the design of traditional mews homes but offers 21st century contemporary design features, such as high ceilings, picture windows, open-plan living spaces, en suite shower rooms and integrated kitchen appliances. Externally, all homes have parking spaces, or garages. The development itself incorporates landscaped communal gardens for the enjoyment of the residents. “We are able to offer a variety of accommodation and floor plans which will appeal to first time buyers as well as more mature buyers and buyers wishing to downsize to a more manageable property,” she said. Residents at Stannington Mews will find a wealth of leisure opportunities in the local area. The beautiful Northumbrian countryside lends itself to outdoor pursuits such as horse riding, hiking and cycling, while the North Sea coast is perfect for watersports. The popular market town of Morpeth is nearby and features a range of artisan shops and food stores as well as a weekly market. For families, there are several well-regarded schools near the development, including Stannington First School and Morpeth Newminster Middle School for younger children, and The King Edward VI Academy for secondary pupils. For commuters, Newcastle, Gateshead and Durham can be reached in just 25 minutes, 30 minutes and 45 minutes respectively via the A1. The A19 meets the A1 at Seaton Burn, enabling travel to Sunderland in less than 50 minutes. The nearest railway station is at Morpeth with regular services operating from there to Cramlington, Newcastle and the Metrocentre in Gateshead. East Coast Main Line and Cross Country services also stop at Morpeth, with trains running to Edinburgh, Durham, York, Doncaster and London, among other destinations. Newcastle Airport is 20 minutes’ drive away via the A1 and the A696. Our sales office is open 11:00am - 5:30pm Friday to Monday and 11:00am - 7:00pm Thursday. Closed Tuesday and Wednesday.